Weighty Matters: The Aspire Assist: Brilliant or Brutal? 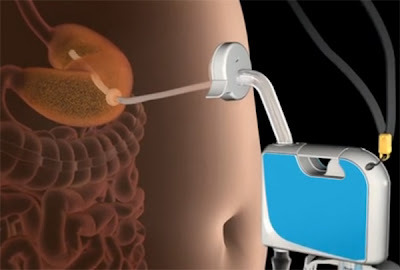 Surgically Assisted Weight Loss or Mechanized Bulimia? The Aspire Assist: Brilliant or Brutal? 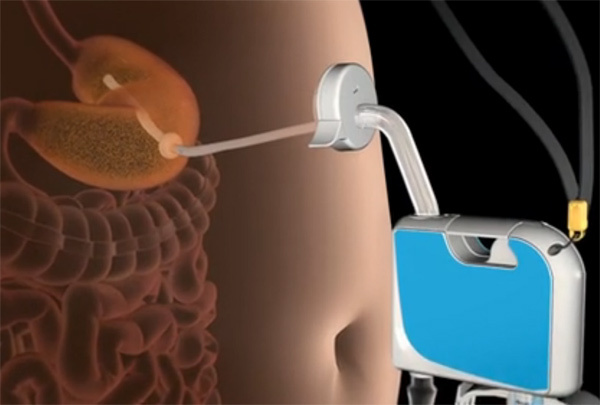 Surgically Assisted Weight Loss or Mechanized Bulimia? So how do you think the boardroom table discussion went when this idea was first being kicked around? "Um......so maybe we could make a hole in people's stomachs and then hook that hole up to a machine that hoovers up food before it can get digested?" "Are you effin' kidding me?" "No, I mean think about it, there are tons of people who aren't bulimic who think about being bulimic, this way we could make it all medical and stuff". That's certainly the tenor of the discussion out there as generally the reports on this are either pretty angry or simply express revulsion. Superficially it really does sound horrifying, and undeniably, at first blush it's not what I would consider to be the intervention I'd always hoped for. But when researching the story of course I needed to know - what type of studies have been done on it to date? Believe it or not, their very preliminary data's interesting. Now this isn't peer reviewed published data, just a poster presentation, but in it they describe the 11 patients who were given an Aspire Assist (that's what they're calling it) for a year. 10 of the 11 completed the year and from the poster it would appear they lost 44lbs on average. So yes, back to the shock, horror and repulsion - I readily agree that on its surface both the premise and procedure is less than appetizing (honestly when considering this post before delving into it I had expected the post to be extremely negative), but if larger, longer, studies suggest it's well tolerated, doesn't lead to or exacerbate disordered eating, involves minimal risk, has minimal adverse metabolic or nutritional consequences, and leads to sustained losses which in turn had demonstrable medical or quality of life benefits, why wouldn't I consider it? As I've written before it'd be wonderful if everyone lived incredibly healthful lifestyles and in turn that living incredibly healthful lifestyles guaranteed desired weights (they don't BTW), but I think my job as a physician is to ensure people are equipped to make informed decisions, not to make decisions for them, or to judge the ones that they make. If the Aspire Assist proves to be both safe and efficacious in the long run, I'll happily discuss its pros and cons with each and every suitable patient. I'll also happily discuss more traditional bariatric surgery, pharmacotherapy, purely behavioural therapy and also the option of doing absolutely nothing with them. And I'll do it all in a nonjudgmental manner too - because my job is to ensure my patients are aware of the risks and benefits of all of their treatment options, including watchful waiting, and then to support them in whatever informed decision they make. To do otherwise in my mind is contrary to the spirit of medicine and suggests one of two exceedingly common and unfair weight biases. First the one that often angrily asserts that unless a person is willing to make formative lifestyle changes, they're not worthy of being helped, or the second - that if only patients wanted it badly enough, they'd just fix themselves. Honestly, if desire were sufficient is there anyone out there who'd struggle with anything? So is the Aspire Assist brilliant or brutal? Given it's just been born, it's going to be at least a decade before we'll even have the chance of having the robust long term data to make an informed decision. Until then all I can really say is that I'm looking forward to reading it.